Mark Verbos’ page reveals the reverb tanks for the original 275 were in a metal case along with the reverb driver and return amp circuit to minimize noise. Line level signals are sent to and from the tank assemblies. I’ve seen folks here wondering at the buzz in the 275r and I believed using shielded RCA cables directly off the PCB to the breakout panel would minimize it as the wiring connectors specified in the BOM were unshielded to the best of my assumption. This didn’t really work. The tank output jack would buzz if you moved your hand near it, as well as the male/female connections I had between the module and breakout panel. What it apparently is and this is an assumption from a non-tech, is that the return from the tank should be physically as close to the reverb return gain circuit as is realistic in practice, to minimize the noise. I note on Dave Brown’s always amazing pages that in the 208 he cut the unshielded PCB trace down out of the return amp to the motherboard and using shielded cable, wires directly from the reverb tank output terminals to the return amp circuit. I’ve built a couple using this method and they sound fine. There is only about 6-8" of wire length from the return to the circuit. So. I’m interested in getting a Hammond case and mounting the bare reverb tanks and at minimum, the return amp circuit inside it per the image at Verbos’ blog. This of course creates many questions and I’d appreciate all the help I can get in realizing this concept. I’ll provide home-etch art for others to duplicate the project if it’s successful and beneficial. -Should both the reverb amp circuit and the reverb return circuit be in the tank case. -Where to the driver circuit to tap signal to tank at line level for 3’ to 6’ cord lengths? After 100K off of pin 1 of TL072? or just the input of the LM380. -Is the best place in the return amp circuit to then send to the PCB after the 30K? Evidence the only thing I passed in medical school were the hand-writing classes: quick trace-out of the 275r. I couldn't have done it without all the help. 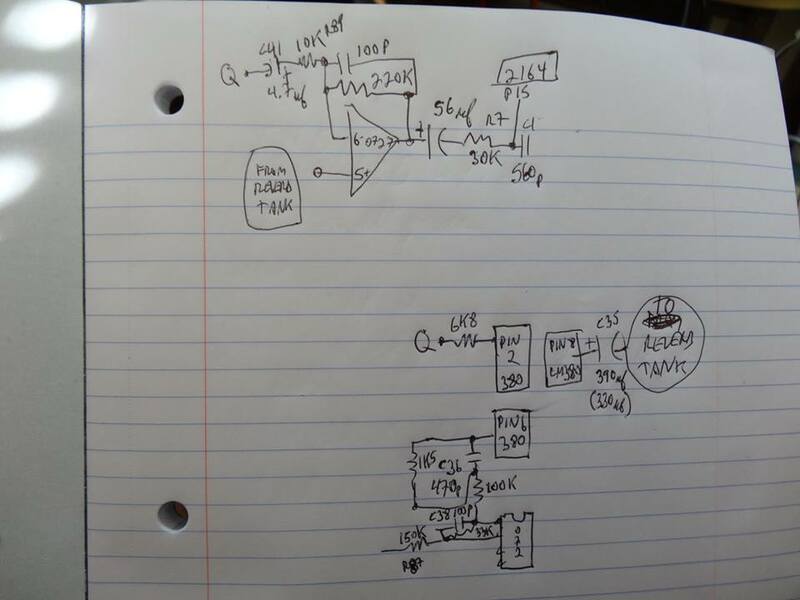 The problem now is figuring out where to inject this signal on the module PCB because in skipping the PCB's recovery amp, skips an apparent connection out to the mixing and it only comes out the Reverb Only output jack. Also have to skip doubling up on big caps in the signal path as they cut the bass. Perhaps mod the module's existing recovery amp to unity gain, lose the 4.7uF to ground, and just run the signal to the input where the RCA jacks mount. If you can give me like 3 weeks I'll be on to my 275 and would love to help you test your mod.